ConstructionChat / Articles / The 3D printing pen creates solid drawings in the air. 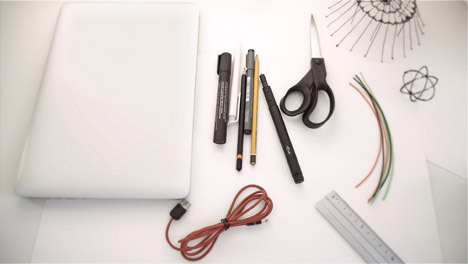 The 3D printing pen creates solid drawings in the air. A team of London-based designers claim to have created the world’s smallest 3D-printing pen – an anodised aluminium device called Lix that allows users to “doodle in the air”. Described by its creators as “a 3D printing pen or manual micro 3D printer”, the 16.4-centimetre-long Lix looks similar to an ordinary pen with a slim aluminium body and fine nib. At its widest the Lix is 1.4 centimetres thick, and weighs 40 grams. It can be charged via a power cable that plugs into any USB port and can melt two types of plastic filament – ABS and PLA – to create a liquid plastic “ink” that cools and solidifies rapidly to give rigidity to a line as it is drawn. Buttons near the nib allow the user to control the output of the melted plastic and the thickness of the drawn line. The pen launched on crowd funding site Kickstarter earlier this week and has already raised more than ten times its target funding of £30,000. Its designers say it will have unlimited applications in both the creative industries and further afield. It has already been backed by fashion designers, architects, stylists and even lawyers. “One lawyer stated she needed the pen for ‘Possible use during trials of Med-Mal cases to provide 3D images of various body part(s) lost due to negligence’,” said Delphine Eloise Wood, co-founder of the newly established Lix Pen Ltd, the company behind the project. “You do not need any sheets of paper or pencil trying to make your sketch more expressive and understandable, or giving your drawing more realistic and detailed fill,” she added. The team identified USBs as a common power source that they say will make the pen “more portable and universal in use to everyone”. The company could not confirm who will manufacture the pen, but the designers expect to finalise the production prototype by the end of June with a view to shipping the first batch to Kickstarter backers by September.